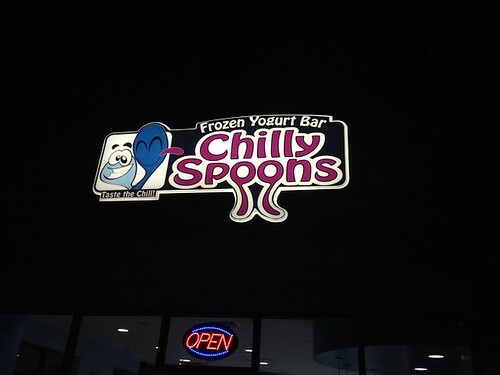 Chilly Spoons | Eat It, Damn It! I’ve been to plenty of buffet and/or self-serve establishments, but a self-serve, buffet ice cream/frozen yogurt bar is definitely a first. MG and I were greeted when we entered the door by the sole employee. He asked if it was our first time and walked us through the process. Your ordered is tabulated by weight. You can choose any combination of flavors and topping. It is all weighed at the end to the tune of 45 cents per ounce. I am amazed that they can turn a profit. 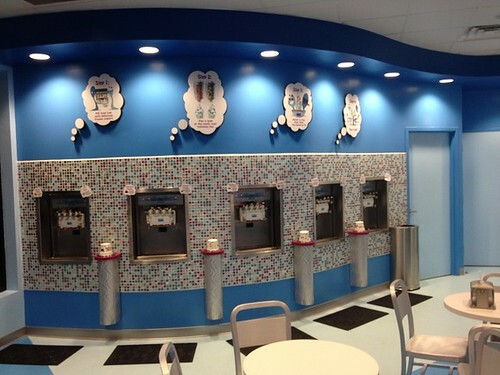 These are the soft serve stations. Each section has two flavors. There is a little placard next to each pump describing the flavor, and listing the nutritional information. Sorbet is available for the lactose intolerant. Though each section has two flavors, there are three pumps. The middle nozzle dispenses a mixture of the two flavors. The fellow working there gave us little cups to test flavors. The Heath frozen yogurt was excellent. The peanut butter froyo was also nice. In the end, I ended up getting the cookies and cream. It was delicious, rich, and fat-free. Check out the size of the cup. That’s the only size. That’s not a large. That is the only size you can get. Have as much or as little as you want. Look at that topping station. Just about every topping you can imagine was available. There was shredded coconut, toasted coconut, M&M’s, peanut M&M’s, Reeces Pieces, Reeces Cups, cheesecake chunks, graham cracker crumbs, chocolate chips, peanut butter chips, almonds, walnuts, peanuts, chocolate sauce, peanut butter sauce, caramel sauce, whipped cream… The list is ridiculous. I could not believe the plethora of choices. 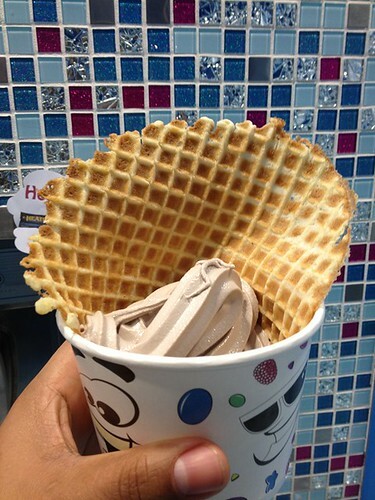 Our facilitator was kind enough to comp us some waffle cups, since it was our first visit. Our total came to $7.90, and we were certainly not wanting for more. 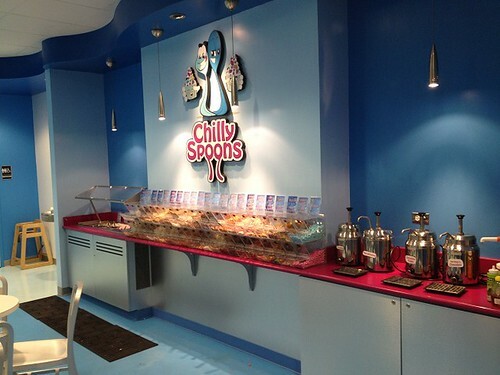 Definitely make a stop into Chilly Spoons. It is not amazing froyo, but the experience of serving yourself and trying all the combinations under the sun is simply too good to pass up.